Androidpc.es has written a review for the low cost ($49) Kimdecent T21 dual core mini PC in Spanish, and I’ll provide a summary of the review in English below. Kimdecent T21 is an Android 4.1 HDMI TV Stick powered by Nufront NS115 dual core Cortex A9 processor. Check out my earlier post about Kimdecent T21 for specifications. The package comes with T21 mini PC, a power adapter with USB to micro USB cable, and a user manual in English. You can also watch T21 Unboxing Video on YouTube. The user interface is a standard Android screen, albeit with power and volume buttons in the Status Bar. I don’t really find this interface very suitable for the TV, but you can always install your own launcher such as Android TV Launcher (apk), or other launcher apps available on Google Play. Beside powering the system down, the power button allows you to access recovery mode to make a backup of the system for example. Beyond using USB or wireless mouse/keyboard, the device supports HDMI-CEC, which means you should be able to use the TV remote to control the device as long as you TV is HDMI-CEC compliant (Not tested by Androidpc.es). Kimdecent also offers as a remote control app (BiggiFiVMG) that can be used in any mobile Android devices. After installation, you need to input the password (default: 1234) to pair with the mini PC and start controlling it with your Android smartphone or tablet. The remote control app can also take advantage of the gyro sensors of your device which can be used for games for instance. Going into the Android Settings section of the device, we can see the model is GV-21, it’s running Android 4.1.0 on top of the Linux Kernel 3.0.0. The HDMI settings allow you to select between 720p and 1080p video output, as well as adjust to screen position to compensate for overscan. Androidpc.es tested the network performance. Despite only supporting 802.11 b/g, the signal strength is good (-57dB at about 2m), and a local FTP transfer was performed at 1120KB/s, which is pretty good for a Wi-Fi connection on this type of device. USB Ethernet dongles did not work, but Kimdecent said it was a firmware issue which would be resolved with next firmware update. Since Nufront NS115 (in T21) and Rockchip RK3066 (in UG802) are dual core Cortex A9 + Mali-400 GPU SoC, I would have expected better results, even though RK3066 GPU has quad cores versus two cores for NS115. I can only assume the reason behind the huge performance difference is the firmware is not as mature on NS115, unless they had to lower the frequency a lot to avoid overheating. YouTube and Sopcast applications played SD and HD videos smoothly. Kimdecent T21 mini PC has a stable firmware, good Wi-Fi signal & performance, does not overheat, features a soft power button that is lacking on many device, and provides excellent value for money at $49. However, the SoC performance is disappointing, Linux support is not available (not the GPL source code), and Ethernet does not work with the current firmware. 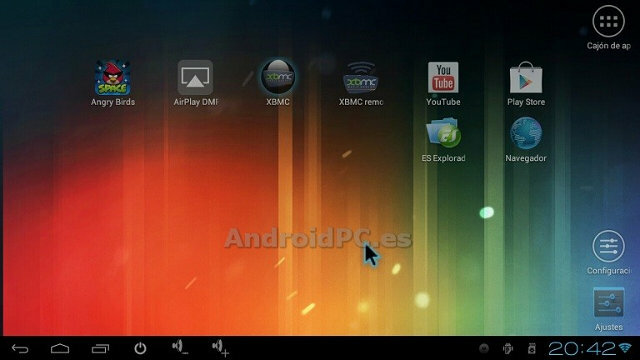 For more details and pictures head over to the review on Androidpc.es.